Yeah I started speed running the game. My record is 3:43. I want to show people the game. I would like to see exoticpanda submit a run on the Leaderboard. You're almost right. Coin values are correct but drop chance looks like table below. When you bring Knightin'+ in Wolod i might do a no damage run cause this game right now is highly probable for no damage run. At least for me it is cause i just push this game to its limits! Now 100% no damage is probably like 5% possible but if i can find a way to push that to it'd be AMAZING! if some one can do it please show me how you didn't get hit! You're right. I consider Knightin' a somewhat easy game after you get used to it. I did a couple of no damage runs too while testing it. 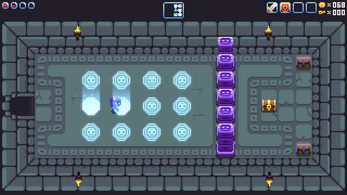 New types of enemies and traps in Knightin'+ won't make player's life so easy in later dungeons. Thats nice did you get one without getting hit? So i found out i can get 100 coins before visiting shopkeeper on 3rd floor which saves time because last time i had to grab the Ring of Speed and kill a couple people then go back to shopkeeper but now i just take quick stop and go straight ahead no turning back! Was hoping for under 8min run but somehow my 3rd floor is somehow slow in this run by 6secs compared to floor 1 and floor 2 costing me the run although LiveSplit says its only 0.86secs possible to shed off. IDK if LiveSplit is telling the truth but i think under 8min is possible and LiveSplit is telling me 8:02. Another Perfect run! just finally got perfect mushrooms and with me now only needing 1.4 second faster to get 3:29 is SICK!! YES! Got Floor 3 Flawless the eyes were the hardest off all in the run but i got them in one go! Good job on beating the most challenging room in the whole dungeon so fast! I love this game and speedrunning it is even better keep up the good work Wolod cant wait to see the sequel of this game! Good Luck! I expected 3:38 or 3:37 but I got slightly faster as i went onto floor 3! This is the route and there are other directions in the description below just to describe a certain part and how to do boss easy. You Could add easy, normal, and hard mode options to the game. I don't think that I'm going to update this game soon. But I'm working on Knightin'+ right now. It will be a really extended version (or sequel, or remake :D) of this game with different dungeons, more content and various game modes. Nice! Thanks it would be nice to play a sequel love the content keep it up! So i just did a 100% speedrun which im calling all floors fully discovered and all items collected (including shopkeeper) and that one key you have to get in the way back of the third level ;) my was that part the hardest! well ill post my time for anyone who wants to try! also the bonus rooms you have to do the codes and open the chests and all shopkeeper items (except heal potion it just heals you). Thanks Wolod it was alot of focus required and the RNG of those mushrooms and just hoping they drop coins for me to buy the key on the third floor! The mushrooms went wherever they wanted. But i feel my record is at hardest now i cant even pass it! i do believe that 3:38 or 3:37 is possible but those mushrooms need to be perfectly centered for me to pass the first room with a good time. how can I get the Linux version running? I'm running Ubuntu 16.04. Thank you for any help. Just unpack .zip file you downloaded and you're ready to go. Or do you encounter any errors while trying to run unzipped game? I seem to be at a loss as to which file to run. There is no x86, x64 or even a .sh file to run. File called "nw" should do the trick. i was fast on my feet this time! If You may see this i have beaten your record by 1 sec as 3:52.0 finding the same route you may have used to beat this. my previous PB was 4:24.3 using a different route. Wolod, Thank you! I had to time myself on my tablet to see my record it was hard to do but i got the world record!!! OMG i got the world record 4 minutes and 57 seconds!!! My congratulations! It's a really impressive result! i'm also doing a speed run so ill tell you my time at the end!!! ok this is my updated chart! I'm working on an extended version of Knightin' right now. It'll contain much more content and achievements (like 100% completion). Sweet! Do you happen to know what program you used and no, I will not make a copy of your im just wondering? now lets shove that question out the way I love your game i love so much since i have found this i have played every day!!! thanks! At first i used sketch nation cause that's the best drawing program i know of, i'm glad i can try to do this program because i have a game sorta yet not sorta like your game for example armor will be equipable and weapons to, but i'll take a dungeon that looks a lot like yours, yet items, weapons and anything else is upgradeable!!! i'll tell you when it's finished but do not worry it will only have one reference to your game yet, you're in control of the game, Wolod if you don't want me to make the game you do not have to! END OF GAME CHART!!! 100% DONE!!! oh now i get it's the map!!! i got the ghost amulet!!! THIS TABLE HAS ALL THE DATA FROM EACH FLOOR IF THIS RIGHT! as you can see from the photo im am stuck on this one room. There are 2 ways to solve this puzzle. Easy one: QR code on the same floor contains solution. Hard one: look for the small square holes on the floor located in some rooms on this floor. They are hints for the right combination. If you can't progress any further buy a key from the merchant or look for the key you might've missed on the previous floor. Anyway if this comment won't help you let me know. I'll give you a solution. I'm currently working on a Zelda-like game with low-poly visuals and I must say that the simplicity on your game was truly inspiring. Thank you for this game! What can i say? Perfect work, pixel style dungeons, a few types of enemies. Music as good as my memories from nes-retro games :) Really good work!